Artists from around the world have always been influenced by other artists. 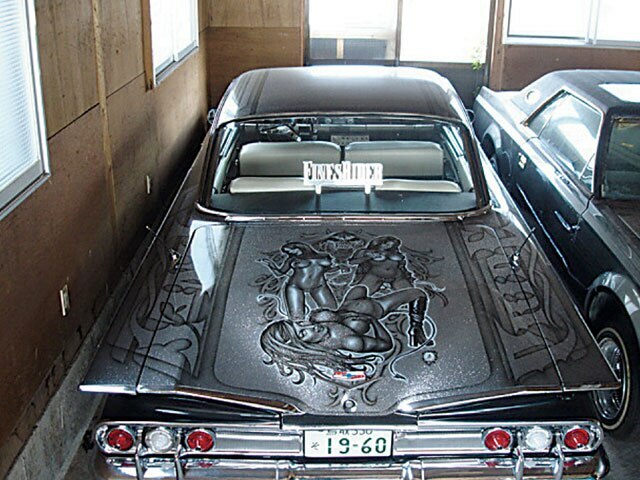 In the case of Yasu, who was born and raised in Japan, he tapped into the growing lowrider arte scene. 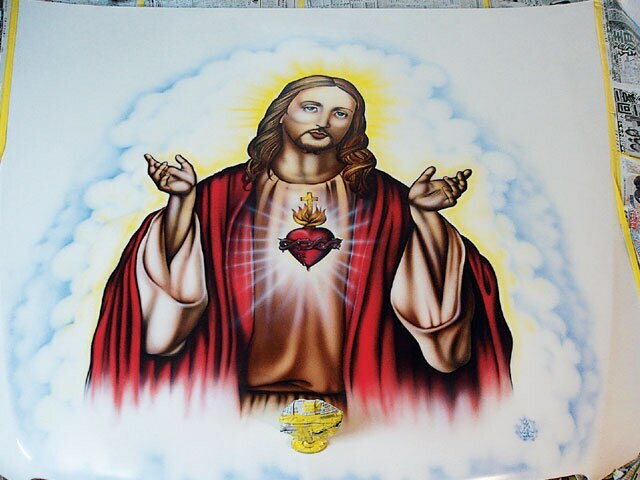 Yasu is not just a master artist; he’s a multi-talented individual who owns a successful car customizing shop where he does everything from hydraulics to interiors and custom paint, including candy, flake, pearl, fades and airbrushing. 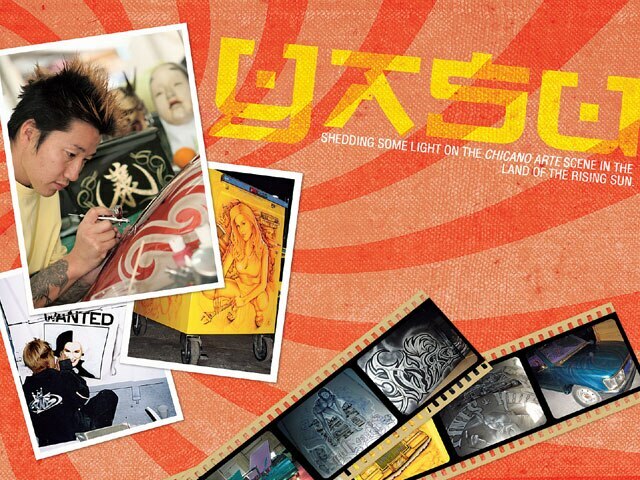 Yasu enjoys doing his artwork the most, especially since it’s his biggest stress reliever. Art takes him to an entirely new world, whether it’s taking his sketches to the metal of a car to complement his paint schemes or on his computer screen where he makes his designs come alive with different forms of graphics. Yasu is an artist who makes every possible effort to turn his work in on time and he would never jeopardize his connection to his wife and kids. He’s able to manage a shop, do his work, take his kids to school, and make it home on time for a family sit-down dinner. Yasu is so close to his family that he rarely travels without his wife and kids. He did take a little bit of time to do a quick interview and this is what he had to say. 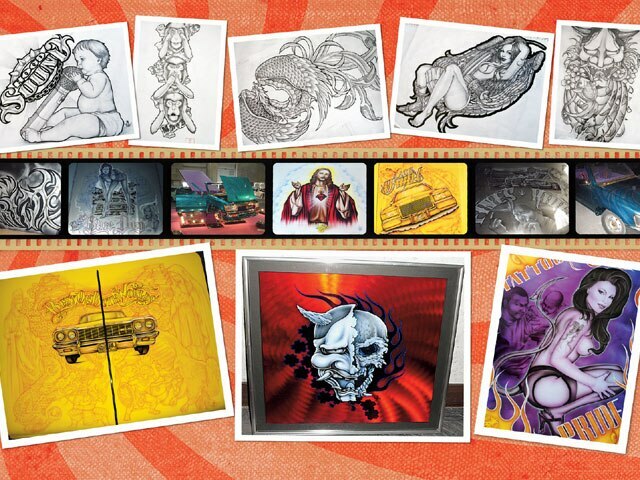 Q: What inspires your artwork and how much of it do you gather from life on the streets or lowriding culture?A: I gather inspiration everywhere from every kind of media, pictures in magazines, television, movies, tattoo styles. 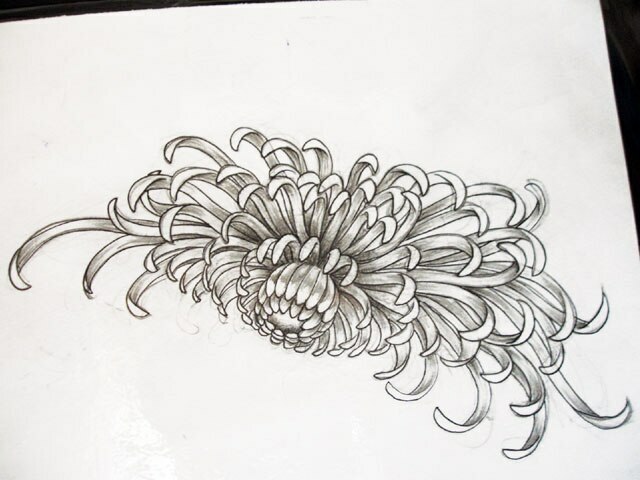 Q: Do you have any formal training or were you self-taught?A: I didn’t have any formal training; I just liked to draw. Q: Where do you see computer-based graphic arts going?A: Computer quality is always rising. Q: Which artists do you follow? And what do each contribute to the art game?A: OG Abel and Mr. Cartoon. They both raised the bar for muralists. Q: How does artwork in Japan differ from art done in L.A.? Or is there no difference?A: The clientele in Japan is more about image and accepts more of the artist’s ideas, The clientele in L.A. wants and demands more control over every aspect of the mural. The American style is always in demand in Japan, the Japanese style is finding its way into the U.S. more and more. Beautiful girls are always in style. Q: Give us a list of some of the bigger companies or organizations that you’ve done work for?A: Lowrider Japan Magazine, West Up TV, “Big Ron,” Techniques C.C., Imperials C.C., Lifestyle C.C. Q: What defines you as an artist?A: Every piece has to make me happy. I put 120-percent into everything I do. Q: What’s your definition of art?A: Art is a great source of joy, like candy for a kid, a reliever of stress. Q: What are the five things that you can’t live without?A: Family, friends, luck, drawing implements, manga. Q: How has art changed your life and where do you see yourself or artwork in 10 years?A: Art has changed my life profoundly, it has opened many doors and broadened my horizons professionally and personally. I have met many good people and artists who have influenced my style and motivated me. In 10 years I will still be doing my thing, only more refined, always aiming higher. I would like to get to the level where I can do what I do good enough so that I have enough clientele to make a living and have enough left over to help kids in the third world. Q: What tips do you have for beginners in the art game?A: Draw all the time and love it. Keep all of your work so that you can see your progression and critique yourself. Never be satisfied. Q: Any last thoughts?A: Check out my webpage at www.yasu-japan.com. Notes:Yasu is a man who’s all about his two sons, Leo and Rin. When he wanted to open a hydraulics shop his many acquaintances and friends in the business tried to discourage him from opening up in the rural town where he was brought up. They all told him that to be successful he would have to move to Osaka or Tokyo, but he didn’t want to raise his boys in the more dangerous big cities. Knowing that it would be difficult to make business in the countryside, he opened anyway, with the idea that if he concentrated righteously on doing everything perfectly and on time the business would come to him. Yasu opened Fine’s Hydraulics in ’96 with that ethic, perfecting everything that he does, taking plaques and trophies in every category. In ’98, he started doing murals, and soon after that he was taking best mural trophies. 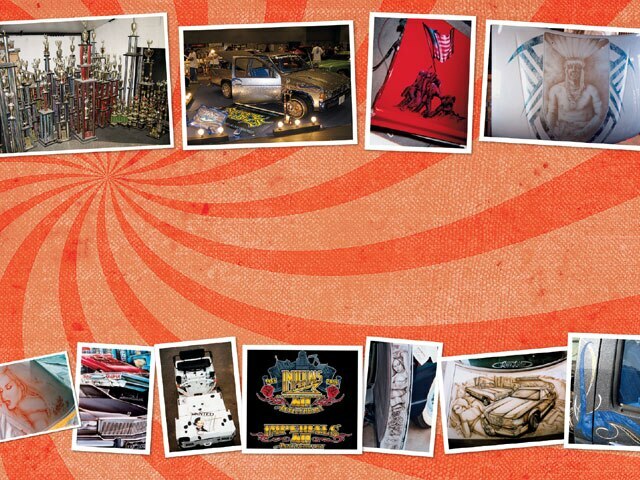 In ’01, he taught himself how to do computer graphics and began designing posters for Lowrider Japan Magazine. With that experience, he’s designing business cards and CD jackets for Japanese hip-hop artists. 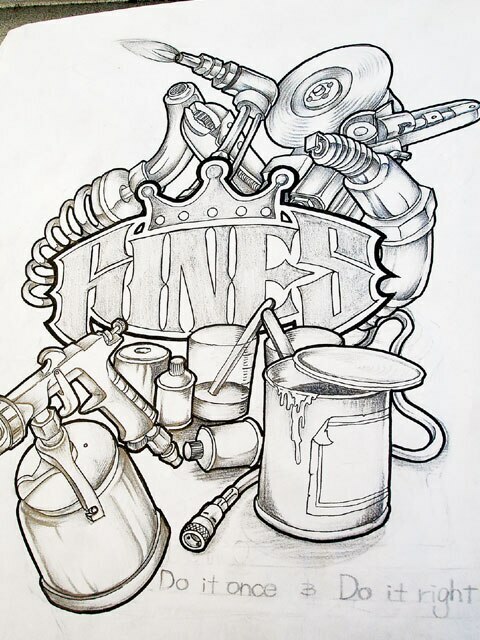 In ’03, he expanded his hydraulics shop to include a clothing/accessory store and tattoo shop. Yasu is a true customizing renaissance man. He does it all from hydros, interior and paint to computer graphics, but doing murals is what makes him happiest. He gets it done perfectly and on time, but not before he gets his kids ready and drops them off at school and only until right before he sits down to dinner with his family.